Klober provide a wide range of ventilation options to enable architects, specifiers and contractors to select the most appropriate solution for providing roof ventilation for a particular design. Whenever non-breather underlays are used on pitched roofs, it is essential to provide cross ventilation of the roof voids in order to avoid condensation. For some more complex roof shapes and mono-pitched roofs, tile ventilators may be needed to ensure there are no stagnant air pockets in any part of the roof. The Klober range of roof vents provide ventilation for both cold and warm pitched roofs, and are available in different specifications and colours to fit in with any roof design. 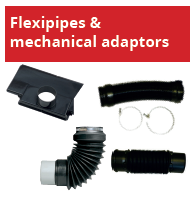 Flexipipes and adaptors are also available in order that the Klober tile vent range can be used in conjunction with mechanical/soil extraction. Klober provides an extensive range of ventilating tiles suitable for different design and ventilation requirements. This includes both universal and in-line vents which have been designed to facilitate specifying, stocking and installation. Available in four colours, they blend in with the roof-line. 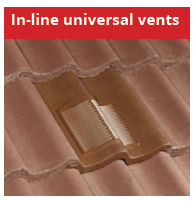 Klober offers a wide range of Slate vents, in a range of ventilating capacities as well as in-line vents to blend in with the roofline. 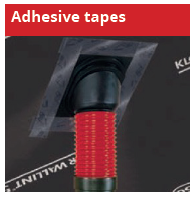 Klober provide a range of adhesive tapes – single and double-sided – for securely sealing connections around vents as well as repairing air-open, vapour-permeable and non-breather membranes. These provide a quick and simple connection to internal pipework. They are an unobtrusive method of venting soil / mechanical systems. No tile cutting or lead flashing is required. In addition everything comes in one convenient pack and are lightweight and durable. 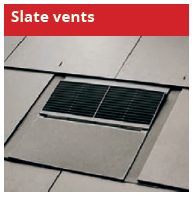 For more information about the Klober range of ventilation options visit your nearest SIG Roofing branch today.